May 30, 2018 – As fully half (50%) of decided Ontario voters declare their choice is based not on the party they support, but the one they wish to block, this final week of the Ontario election campaign continues to underscore a collapse of Liberal support, while people look either to Andrea Horwath’s NDP or Doug Ford’s Progressive Conservatives as palatable, but not necessarily inspiring options. The latest polling from the Angus Reid Institute shows the Ontario PCs and NDP in a statistical tie at 37 and 39 per cent respectively. But it is the NDP that appears to continue carrying the advantage into the home stretch. 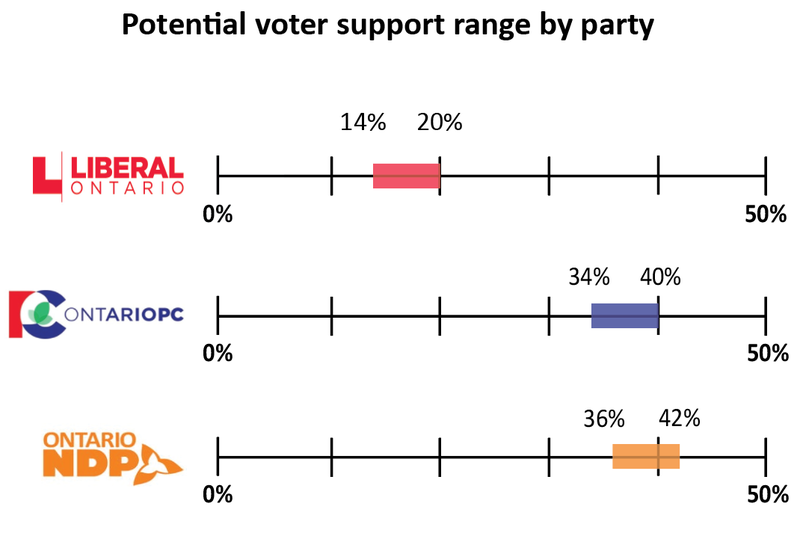 The party – and Horwath – are better positioned on key questions of which leader would make best premier, which party is the second choice of voters, and which party the electorate could never support. That said, while Ford’s own momentum trails his party’s – the Conservatives retain a narrow advantage on best party to form government. The Progressive Conservatives have retained more of their 2014 voters than either the Liberals or NDP. They also enjoy the largest share of voters who are “absolutely certain” about which party they will support.